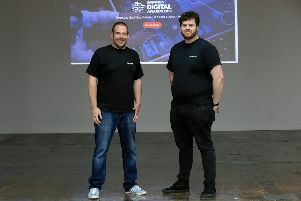 A huge tech hub for hundreds of firms is set to transform Sheffield’s digital economy and kick-start the regeneration of a rundown area of the city. A £3 million revamp of Castle House on Angel Street will turn the disused former Co-op department store into a bustling business centre for up to 1,100 people, developers say. Steve Pette and Nick Morgan from Kollider in the boadroom. And it could be a catalyst for the modernisation of the entire Castlegate area, which includes the Old Town Hall and the former Sheffield Castle site, according to council chiefs. A deal has been signed between the authority and building owners U+I, three years after the money, from the Department of Culture Media and Sport, was announced in the spring budget of 2015. Now upgrade work is set to start, including rewiring, new heating systems and broadband. Original features will be retained including a listed spiral staircase and a boardroom with giant horseshoe-shaped table. The building, which dates back to 1962, is set to open for business in 2019 and will be run by Sheffield-based Kollider Projects. Steve Pette (Kollider) Guy Illingworth (U+I) and Nick Morgan (Kollider) at the top of the spiral stairs. Nick Morgan of Kollider said: “The ambition is to get as many smart people in close proximity as possible to do great things. But if we build a tech incubator for techies it will exclude people and we want it to be an inclusive building with a social working space and a place where the community is welcome. The hub will have an incubator for start-ups, workspace for small firms, areas focused on subjects such as gaming and investment advice, and a restaurant. Rent from occupants will raise revenue and Kollider hopes to sign a paying corporate partner. The firm bought the building after the Co-op closed in 2008 with a view to reopening it as a shop, he added. But that changed when the tech hub proposal was put forward with a bid for funds from Government. “The market has changed, the city doesn’t need any more retail,” he added. Mazher Iqbal, cabinet member for business, said he hoped it would be a catalyst for the city’s ‘Old Town’. He added: “It’s another step in the regeneration of the area. If someone can take this on, someone can definitely take on the Old Town Hall. The scheme took longer than expected due to complex government protocols when giving public sector money to a private company, he added.